In Part 1 of this article, we discussed symptoms of Mac Mail unable to connect to Exchange 2016 servers through KEMP LoadMaster load balancers. We also discussed troubleshooting steps that addressed the issue of ExRCA.com unable to pass EWS tests, however, we stopped there since Mac Mail failed to connect despite ExRCA EWS tests passed. Let’s see what we can do to get the Mac Mail to connect successfully to Exchange servers. Since we addressed the 100-continue handling in Part 1 of this article, ExRCA tests did not indicate any more issues. 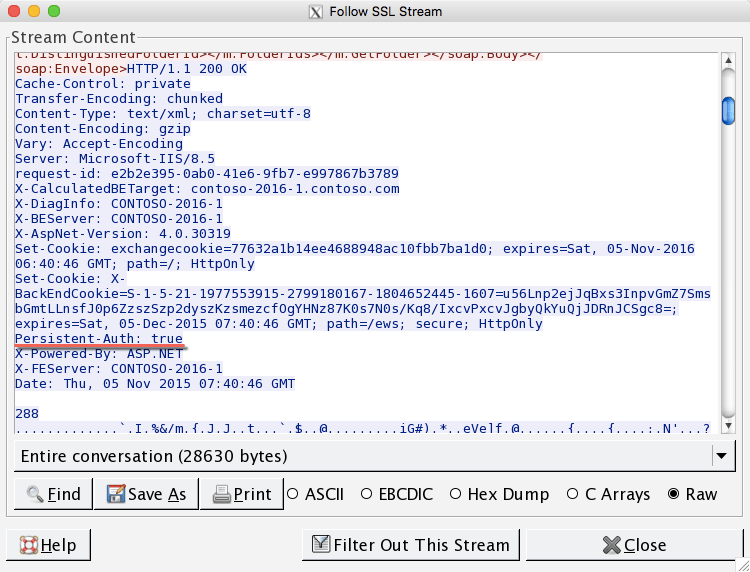 Microsoft Outlook for Mac did not have issue connecting to Exchange even before we changed 100-continue handling to be RFC-7231 compliant. Notice how initial dialog included challenge response for NTLM authentication and ended with 200 OK. At this point Mac Mail client started with another POST operation to EWS. However, this time the pattern followed multiple 401 responses from server and ended with 400. Notice how the pattern looks similar to Mac Mail’s second POST request, however, it ends with 200 OK. The response included data that was requested by POST operation. I needed to correlate this with the data being received on the Exchange server. Due to newer ciphers which use PFS (Perfect Forward Secrecy) I couldn’t decrypt data being received from load balancer by the server despite having the private key used to encrypt the information. I was able to decrypt client side traffic due to load balancer configuration of ciphers that didn’t use PFS. I don’t recommend this configuration in production and KEMP LoadMaster default setup uses more secure ciphers. I had it configured this way only for troubleshooting purpose in my lab and no production data was in flight during testing. While the headers gives you idea of what is included in a normal POST request from the client, for me, the first and last headers are very important. The “Via” header indicates presence of a proxy between client and server. In this case it indicates the IP address of the load balancer. The X-ClientSide (or X-Forwarded-For) header is used by proxies and load balancers to preserve original client IP address when SNAT is in use. SNAT is recommended when load balancing Exchange servers. 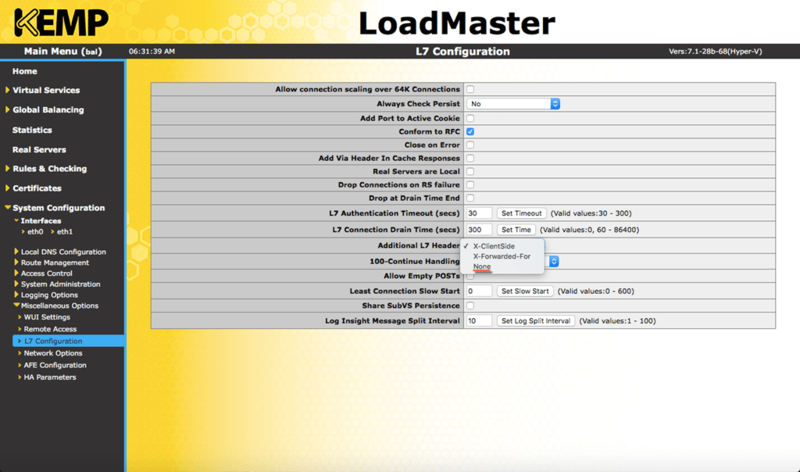 KEMP LoadMaster uses X-ClientSide header by default. When I saw these headers, I remembered the discussion I had with my talented support engineers at KEMP. At some point in our discussions, someone had mentioned that inserting “Via” headers are known to negatively impact Mac Mail client. This seems to be a protective mechanism to prevent man in the middle attacks. Outlook for Mac handles these responses as expected, including authentication information when Persistent-Auth is set to false by Exchange server. Which explains why Outlook worked even when “Via” headers were present. Mac’s Mail client, however, seems to have its own ways. It authenticates intially, but after first “200 OK” response from Exchange server, which also indicates Persistent-Auth is set to false, Mail client follows up with another EWS request without including required authentication information. This results in dreaded “400 Bad Request” error from the Exchange Server. 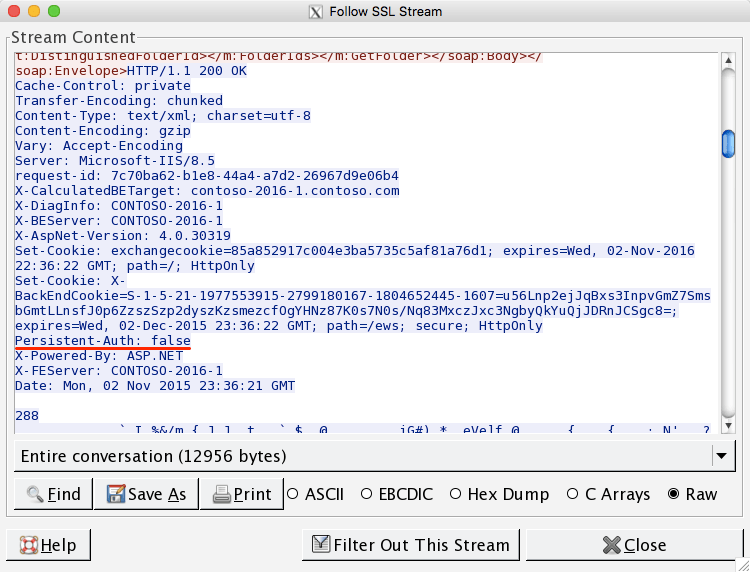 This stops the KEMP LoadMaster from inserting “Via” header in the HTTP stream to the Exchange Servers. Exchange servers respond accordingly, setting Persistent-Auth to “true”. While it’s the Mac’s built-in Mail client that is behaving badly, it seems the load balancer is at fault because changing something on load balancer fixed the issue. Is it? You be the judge! What version of Mac OS and Apple Mail client did you see this issue? Our campus recently upgraded to Microsoft Exchange 2016 with Citrix Netscalar 11.1.58 and running into issues with Mac OS X 10.11 & Apple Mail or older issue. Not sure about exact version, I suppose it would have helped to document that.